The Music Tech Mashup Showcase is a two day/three stages event during SXSW's transition from Interactive Week to Music Week. Featuring a ton of great bands, brands, and emerging new technologies, the Mashup party celebrates the opportunities presented through the convergence of these industries. Hosted by Shinobi Ninja and Coast to Coast Models & Events and presented by GreenShoeLace, HunnyPot, The Deli Mag and Planet Ill, this showcase will assemble the movers and shakers of these converging fields. Artist shortlist: Shinobi Ninja, Vaxhaul Broadcast, McAlister Drive, Bamboo Shoots. 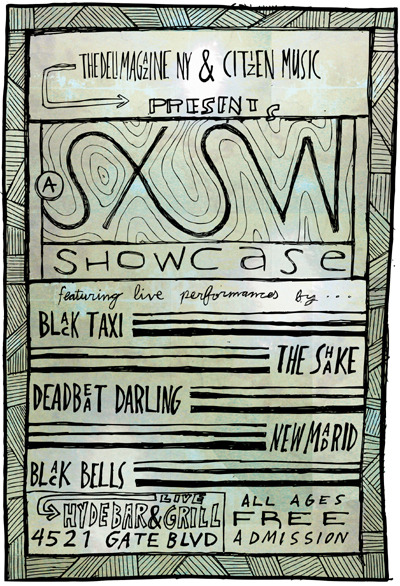 The Deli Magazine NY and CitizenMusic have teamed up to bring some of the best Alt Rock bands from New York to Austin for South By Southwest 2010! "NYC in ATX" will take place on Thursday, March 18, at Hyde Park Bar and Grill (South Location). Music will begin prompty at 6pm! And, to make it rock even harder, it's FREE and ALL AGES. So, if you're heading down to SXSW or if you're already in Austin, come experience some of the greatest rock n roll, and best french fries [so we've been told] New York City has to offer! Selected artists for Music Tech Mashup Party. The organizers of the Tech Mashup Party have selected the 3 artists that will play at their show in Austin during SXSW. The lucky ones are LA alt rock band Voxhaul Broadcast (in the picture), Austin indie rockers Red Leaves, and NYC singer Songwriter Dion Roy - congrats to them and thanks to all the bands that submitted through The Deli! Submit to play during SXSW! 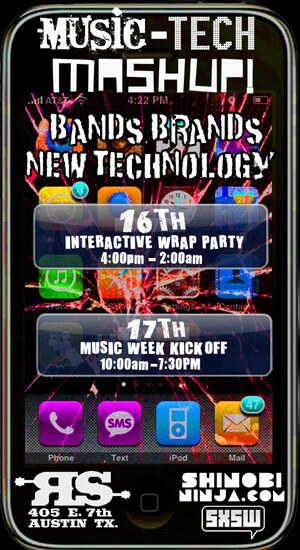 - Music Tech Mashup Party! The Deli has reserved 3 showcase slots at Music Tech Mashup during SXSW, which will take place at Rusty Spurs in Austin, TX on 7th St. on March 17. Rusty Spurs features 3 stages with an 800 person capacity in the middle of it all and is an official SXSW venue. During SXSW it will host shows by heavy hitters like Echo and the Bunnymen, Vega (Neon Light side project) and Semi Precious Weapons (recently on tour with Lady Gaga) amongst others. To apply to play this SXSW show all you need to do is fill in this form HERE and click on the confirmation email you'll receive (this will simply add you to our mailing list and enter your band in our fabulous charts organized by genre and region - one day we'll also create band profiles!). 3 artists will be selected by the organizers (one of them will be a local Austin, TX artist). Any band that is available to travel to Austin is eligible. Submission deadeline is Monday 02.22 at 11.59 pm. Music Tech Mashup Showcase (hosted by Coast to Coast Models & Events and presented by The Deli, Hunnypot, GreenShoeLace) will celebrate the convergence of music and technology and the opportunities it presents for everyone involved just as SXSW itself switches gears from Interactive Week to Music Week.This is a list of some of the artists already booked: Jada - Universal Motown Records (Boston, MA) - Bamboo Shoots - Epic Records (New York) - Shinobi Ninja - (Brooklyn, NY) - McAlister Drive - (Boston, MA) - Odd Modern - (Los Angeles, CA) - Keys and Crates (Toronto, Canada) - Curtis Santiago (Toronto, Canada) - Keith Masters (Chicago, IL) - FutureCop! (UK) - Mark Foster (Los Angles, CA). Deli Best of Local Scenes 2009 Final Summary - don't miss these bands! The Deli's Year End Polls for emerging artists are a great opportunity to catch up with all the most exciting up and coming bands that left a mark in the previous 12 months. Don't forget to check out these bands as they might hit it big in 2010 (if they haven't already! ).